With Kegco's Standard Dual Keg Kegerator Conversion Kit, do-it-yourself beer lovers will have all of the tools they need to convert a refrigerator or freezer into a two product draft beer dispenser that has all of the exciting features that professionals love. 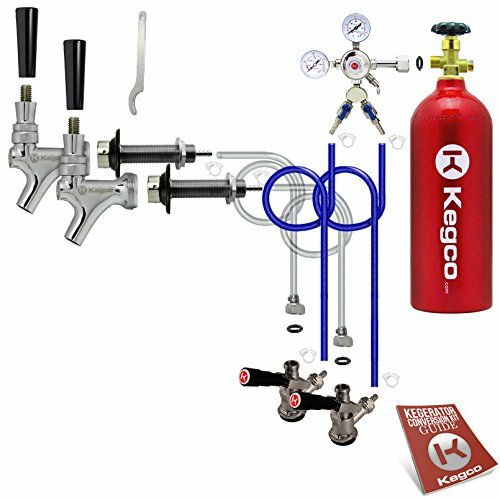 Included in this kit are high quality and high performance parts like a commercial-grade dual gauge regulator that allows you to monitor both the CO2 pressure in your keg and the CO2 volume in your tank, and lever handle keg couplers that are more durable and long-lasting than wing handle couplers. Once the conversion process is complete, your new kegerator will be able to run 2 full-size kegs, 2 pony kegs, 2 five gallon kegs, or any combination you choose, depending on the capacity of the refrigerator or freezer that you have converted. DUAL GAUGE REGULATOR: This Kegco 542-2 Commercial Grade Double Gauge Regulator has a y-splitter and two independent shut-off valves that let you dispense up to two kegs at the same pressure. It features a chrome plate brass body, two gauges to display PSI and Co2 volume, and a large, easy-to-use pressure adjustment knob. Also included are a manual pressure release valve and an integral tamper-proof safety relief valve that releases at 45-psi. LEVER HANDLE KEG COUPLERS: These NSF-approved Kegco KT85D-L D System Keg Couplers feature sturdy nickel-plated forged brass bodies with stainless steel probes, and are designed for use with all domestic brand American D system Sankey kegs. The lever-handle design is easy to use, simply pull out and then down on the handle to couple the keg. A 55-psi pressure relief valve makes this coupler even more convenient to use, allowing over-pressurized gas to escape before it enters your keg. TWO CHROME BEER FAUCETS WITH BRASS LEVERS: Featuring a forged brass body and highly polished chrome finish, these NSF-approved Kegco CFBL beer faucets put a stylish finishing touch on your kegerator at a price you'll love. The brass shaft assembly and lever includes a non-stick ball washer for smooth operation, and the lever has standard threading that is compatible with most branded tap handles.